While in Europe, Trump lectured allies, rebuked Germany, physically shoved another leader, failed to endorse core security commitments and played coy on the Paris climate agreement while his G-7 counterparts unanimously lined up to reaffirm it. Trump proclaimed it a victory. "Just returned from Europe. Trip was a great success for America. Hard work but big results!" he tweeted. Seen from Europe, the performance deepened impressions formed during the presidential campaign that under Trump, the US is ceding its global leadership role in favor of an inward turn. The president of the European Commission, Jean-Claude Juncker, offered a preview of the likely reaction from the other side of the Atlantic if Trump goes ahead and says he will leave the Paris pact during an appearance in the White House Rose Garden at 3 p.m. ET. "I am a trans-Atlanticist. But if the American President was to say in the coming hours that he wants to exit the Paris accord, then it is our duty to say: 'You can't do that,'" Juncker said in Berlin on Wednesday night, according to the commission's office in the German capital. In the aftermath of Trump's visit, German Chancellor Angela Merkel told her citizens on May 28 that "the times when we could completely rely on others are, to an extent, over." Derek Chollet, a former assistant secretary of defense for international security affairs in the Obama administration, said a danger is that Europe won't want to follow Trump if he needs them. "In his behavior, Trump is spending political capital that he might need to use if he wanted to pursue different policies or ask European leaders to make tough decisions on our behalf," Chollet said. "Whether it's a new approach to Iran, a new approach to ISIS, he's giving them little incentive to cooperate. In fact, he's giving the opposite incentive: not to cooperate." I've been suspecting for quite a while that Putin has been orchestrating a reorganization of the West with the U.S. leaving what we've termed the "free world" and joining an axis of authoritarian states. 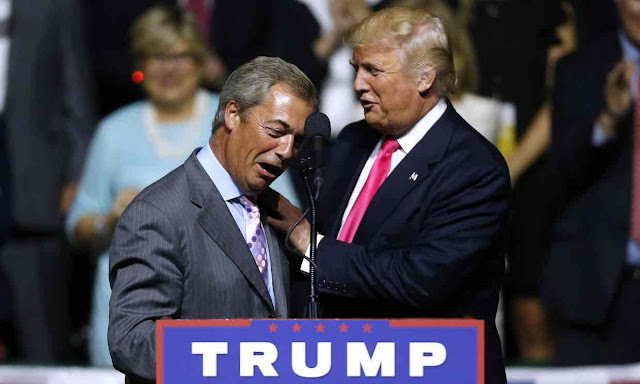 Strangely, it wasn't Trump's kissing up to Putin, or the involvement of pro-Russians in his campaign, that made me realize that last summer -- it was when Nigel Farage showed up to appear with Trump at a rally in Mississippi. Nigel Farage's raison d'etre is literally to divide Europe. That made it feel like Trump was involved in an attempt (which, admittedly, has turned out to be less ham-handed than I thought) to pull apart Europe at both ends. Sources with knowledge of the investigation said the former Ukip leader had raised the interest of FBI investigators because of his relationships with individuals connected to both the Trump campaign and Julian Assange, the WikiLeaks founder whom Farage visited in March. WikiLeaks published troves of hacked emails last year that damaged Hillary Clinton’s campaign and is suspected of having cooperated with Russia through third parties, according to recent congressional testimony by the former CIA director John Brennan, who also said the adamant denials of collusion by Assange and Russia were disingenuous. I think this is a good sign -- it means that the FBI sees just how huge a conspiracy this is and that the motive for everything that Russia and Trump are up to is not just about kompromat, or sanctions, or finances, or oil... it's about a concerted effort to deeply change the world in favor of a cabal of wannabe and true dictators and that Trump is deliberately putting us on the wrong side of it. That'll motivate our intelligence agencies more than just the theft of an election in favor of a guy whom, let's face it, most of them probably preferred to win. And I think between Trump's alienation of Europe and the intelligence agencies, combined with expanding the scope of the investigation, means something's going to pop sooner rather than later. The big story is the "unmasking and surveillance" of people that took place during the Obama Administration. Yup, we'll look back on this in a few years and remember the Obama administration as being the bad guys.